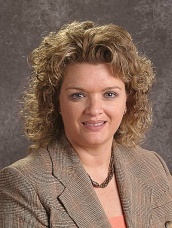 Melissa Sharp became the ninth the principal of Junction City High School at the beginning of the fall 2012-2013 school year after serving ten years as a classroom teacher and an additional ten years as the Academy Principal at the Freshman Success Academy. This is her 25th year as a Junction City resident and Blue Jay activist, and her 26th year in education. Ms. Sharp received her Bachelor of Science in Education from Northeastern State University (Tahlequah, OK) in 1992. She received her Master of Science in Educational Administration & Leadership from Kansas State University (2002), and has also received her Superintendent’s licensure from that same institution. Today, she continues her enrollment at Kansas State as she works to complete her Doctorate in Education. While working in the office for 15 years has offered a wide range of administrative experience, her primary responsibilities include the following: the departments of Math and Special Education, Instructional Coaches, School Resource Officers, Nurses, School Improvement Initiatives (School Improvement Team, School Improvement Plan, Department Leaders, Kansas College & Career Readiness Standards implementation by staff), Budget, Master schedule, & Guest teachers. She also works to collaborate with every other adult assigned to Junction City High School for the success of our student population. Melissa has a son, Paxton, who is a senior student at JCHS. He plans to attend the University of Kansas in the fall of 2017.